Happy National Doughnut Day everyone aka the best holiday next to Christmas! As silly as these random food holidays are, I've always find myself getting excited when I hear about it being national doughnut day. Hey, maybe it's because I've been trying to incorporate more hole foods in my diet ;). Anyway, funny doughnut puns aside, I decided to compile a little list of my favorite doughnut shops around SoCal in honor of today! 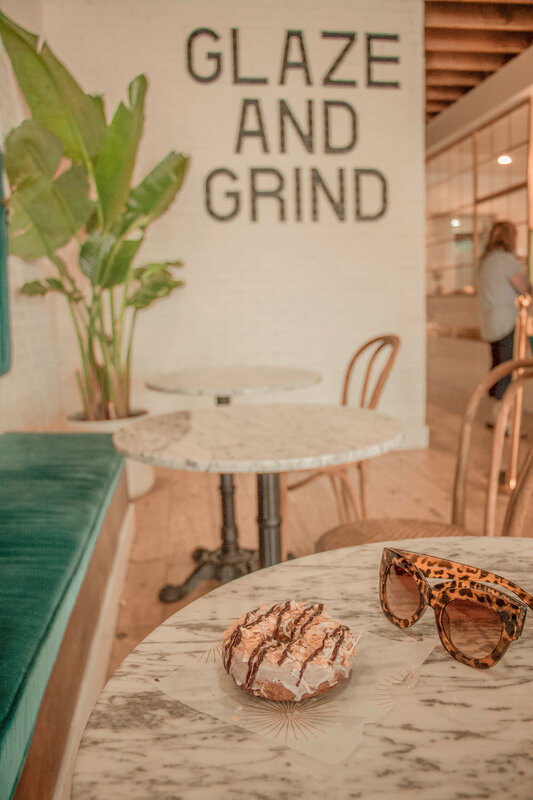 Located in Carlsbad, this little shop is very pleasing for the eyes, from their blue velvet seating, marble tables and GLAZE AND GRIND wall art. Their doughnut selection is equally pleasing. They offer fun flavors like samoas (totally recommend), strawberry cheesecake, chocolate ganache, and s'mores. And to my gluten intolerant friends and vegan friends, they do offer equally delicious looking doughnuts! PS: Can we just talk about how accurate their sign is outside their shop?!? #Same. 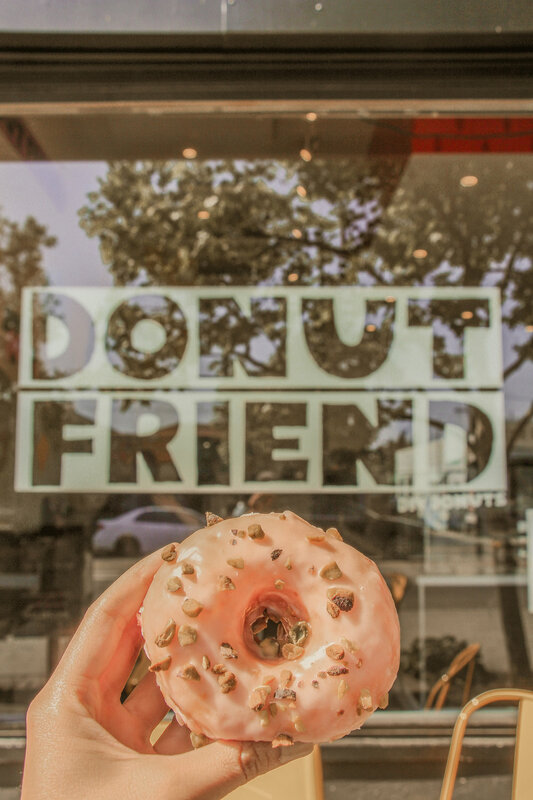 You can find Donut Friend, in good old Highland Park. 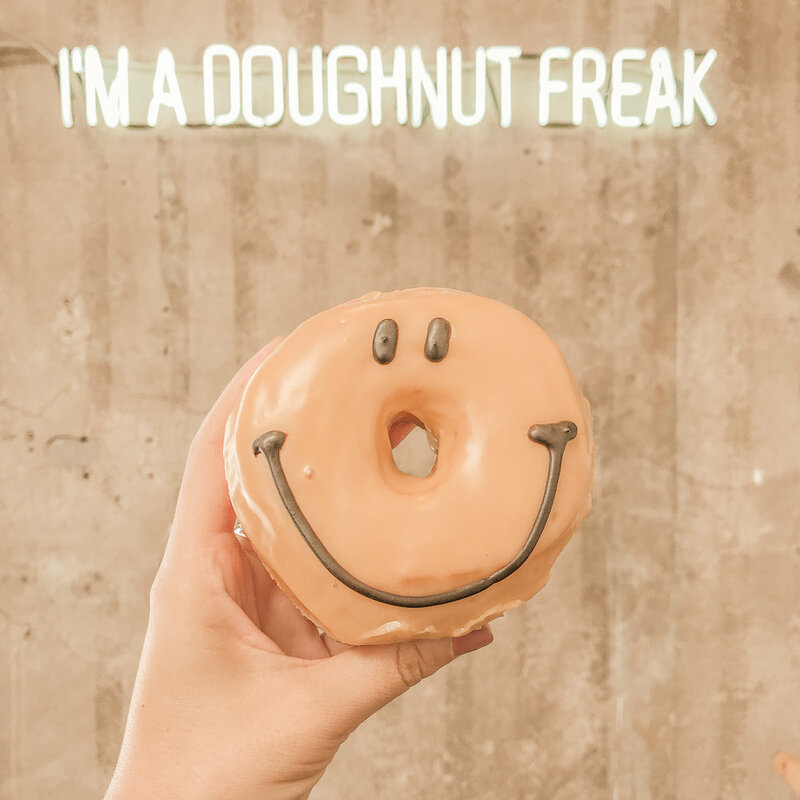 This shop is totally vegan friendly and is great for those who are looking to step up their doughnut game, by letting customers customize their doughnuts with fillings of their choice. I went for one of their seasonal offerings called Hot Rose Water Music (lemon doughnut topped with pistachios) and it only lasted me like 3 seconds... so good!! I'm sure you've seen pics of these extreme doughnuts somewhere on your feed before. 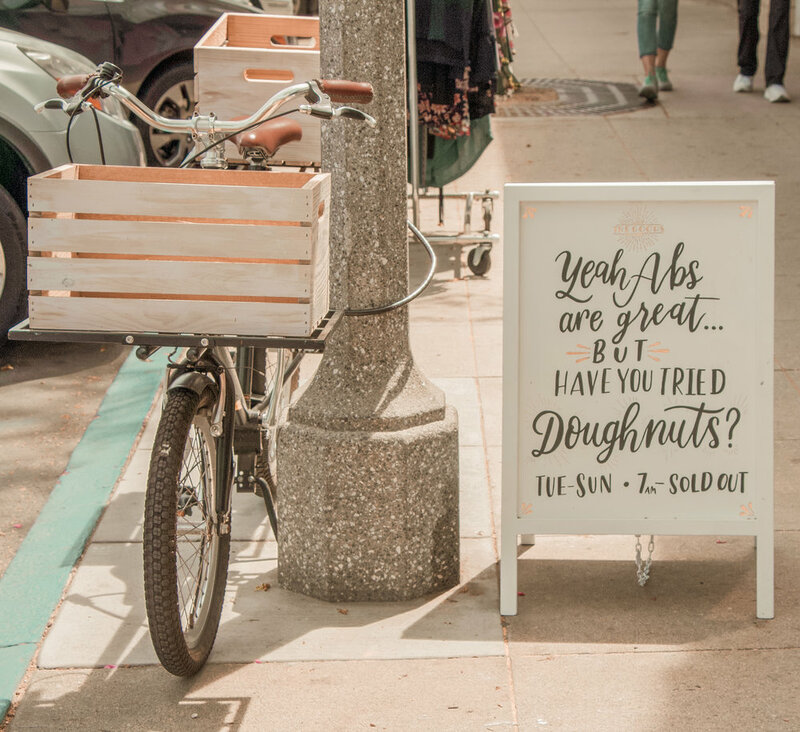 If not, they are known for some of the cutest doughnuts I have ever seen and offer a huge variety of flavors. Located in Koreatown, it can be a bit of challenge finding parking, but the good thing is that they are open 24/7. So when those 3 AM munchies hit, you know California Donuts has your back. Last but certainly not least, Good Town Doughnuts. 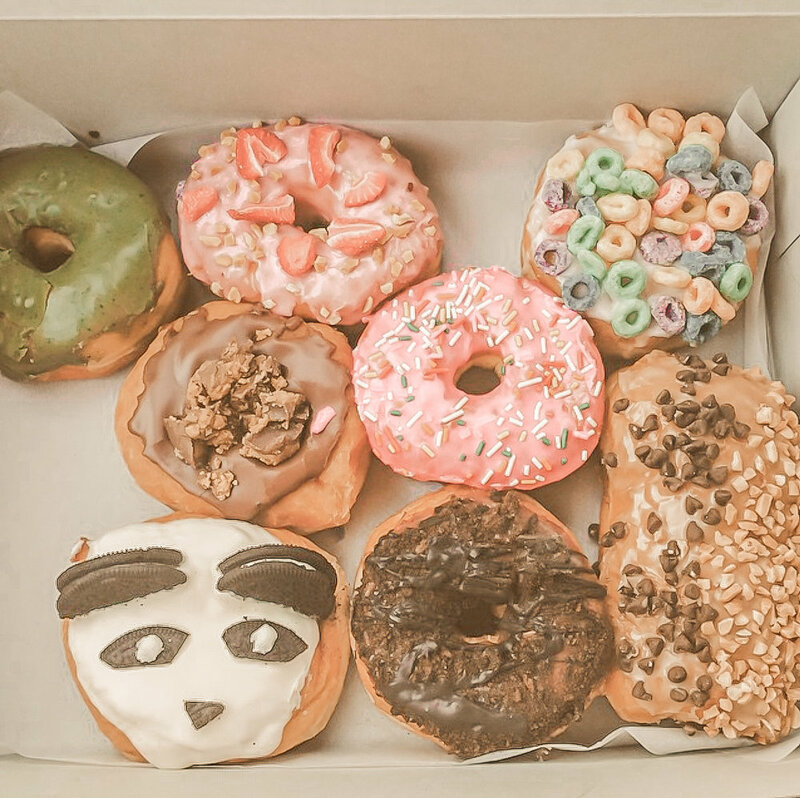 Located in Costa Mesa, in a little outdoor mall called the LAB, they're known for serving up some delicious vegan doughnuts. This place is on the pricier end when it comes to doughnuts ($3-4 each), but it's totally worth it, in my opinion. Out of all the doughnut places I've listed, this is the one place I've visited a few times. That said, I totally recommend their smile mango doughnut, raspberry pistachio, and matcha chocolate doughnut!